Tactical novelties are in stock! HomeProduct NewsTactical novelties are in stock! 03/10/2016Tactical novelties are in stock! All models will provide you with extreme beam distance and stunning brightness. You won’t have any problems with illumination of the details at the distance. Due to compact size and small weight these flashlights are perfect for constant carrying in the bag, pocket or on the belt. You won’t feel any inconveniences. The flashlights are created from the high-quality components from the USA and Japan. Electronics is developed by the team of experienced scientists and engineers engaged in military and space industry. Solid body made of aircraft-grade aluminum guarantees trouble-free work of the flashlights after deep scratches, harsh impacts, strong vibrations and even fallings from the height of 10 meters. Perfect water resistance. The flashlights operate without any failures after heavy rains, temperature drops and even after water submersion at the depth up to 10 meters. And another one good novelty – first Armytek Predator Pro with Warm High Intensity LED is in stock! You can be sure that this reliable flashlight will certainly find an application for various spheres of your life. The company is ready to provide you with 10 years of no-hassle warranty during which Partner Pro and Predator Pro will give only positive impression and ensure no-break operation in any conditions. The impressive characteristics and functional opportunities of this unique tactical equipment will surprise you greatly. 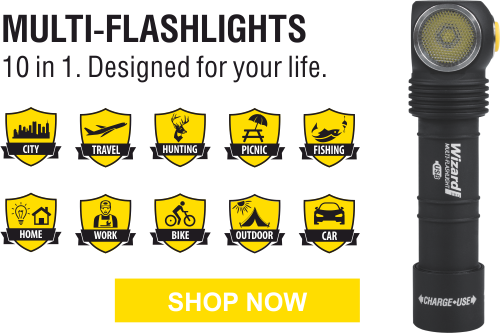 New Armytek Partner flashlights go on sale! Armytek Novelties: there are no boundaries to perfection.